Hitwise tweeted this morning that Facebook reached the number one most visited site in the US for the first time ever over the Christmas holiday, pushing past Google. But digging a little deeper, that might not be so. It all depends on what you consider “Google” to be. Facebook was the most visited site in the US on Christmas Eve and Christmas Day. 1st time the site has been the #1 visited US site ever. On Christmas Eve, December 24th, Facebook had 7.56% market share, whereas Google had 7.54%. On Chrismas Day, December 25th, Facebook grew to 7.81% and Google dropped a bit to 7.51%. The day after Christmas, December 26, Google regained its crown as most visited site in the US with 7.33% share, while Facebook had 7.12%. Note on the chart that Google is defined as “google.com.” We asked Hitwise if Google.com included things like visits to Gmail (gmail.com) or Google Reader (reader.google.com). No — these and anything else that’s run by Google (say Google News, news.google.com) are not included in the “google.com” figure. 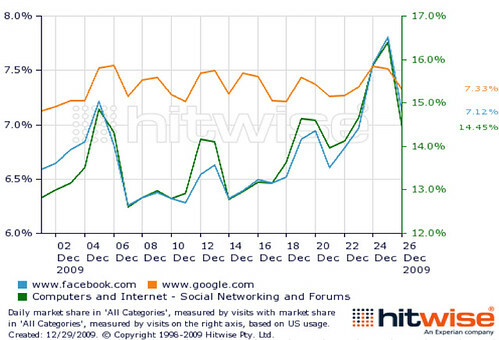 That means pretty much Hitwise is comparing Facebook’s overall traffic to only one aspect of Google, Google web search. Potentially, some visits to Google’s personalized home page might also be in there. But also potentially, a chunk of Google traffic isn’t being counted correctly. Add in the part of Google that weren’t counted, and Google might still have been ahead.